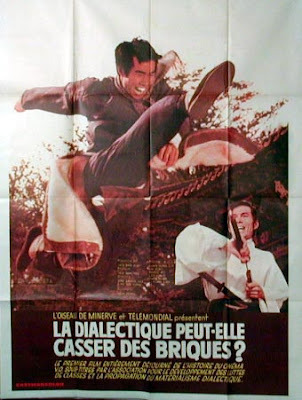 Kung fu with Braudel: Can Dialectics Break Bricks? The effect aimed at is, of course, largely somewhat comical, and undercuts any narrative involvement with a Brechtian Verfremdungseffekt. As I was saying to my colleague, I've not managed to dig up much about the background of Viénet's film, or why this martial arts movie was chosen for détournement, and I find myself with some perplexing questions about this, and about how the original film (directed by Tu Guangqi) might have been understood by Viénet and the Situationist group. Wikipedia (that great authority!) suggests that the aim was 'to adapt a "spectacular" film into a radical critique of cultural hegemony,' and the general strategy of détournement would indeed seem to suggest that it was precisely the most crude and commercialised products of Spectacular society which were targeted by the SI for appropriation, to be refitted as weapons of revolutionary consciousness. Indeed, in the 70s, at the height of the kung fu craze, these films often tended to be regarded by critics as cheap, worthless, contentless, exploitative and mind-numbing products of a culture industry seeking to distract its popular audience and brutalise its sensibility. However, Crush might also have been a strange choice on such grounds. Like many Hong Kong productions of the early seventies (in particular in the wake of Bruce Lee's Fist of Fury) the scenario of the original film is clearly one in which colonial exploitation and resistance are at issue. Set in Korea under the Japanese occupation that lasted much of the first half of the twentieth century, the heroes (those turned by Viénet into 'the Proletarians') are the members of a martial arts school who start to resist the colonial violence of the militaristic Japanese forces. However potentially conservative the nationalistic dimension of its narrative, this is also a work about struggle and liberation from tyrranny in some of its most typically modern forms. This is to say, the film was already highly suited to the new story which Viénet constructed. Crush is not just a tale of conflict and violence, but also a tale of (revolutionary?) struggle against oppression, and of the violence of an imposed bureaucratic regime. Viénet's 'Proletarians' are, in matter of fact, already very much proletarian in Tu Guangqi's original movie. 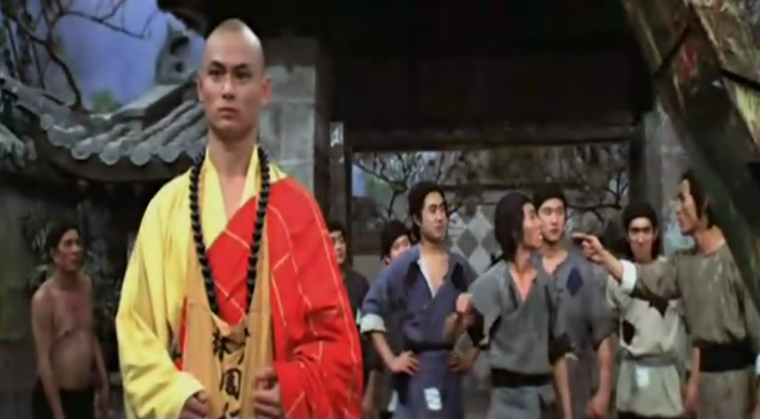 The native martial arts they train in are antithetical to the violence and deculturation imposed by their oppressors, and in this much, and within the colonial context of the film's setting, whether or not dialectics really breaks bricks, brick-breaking is certainly a kind of a dialectic practice. In this regard, the détournement works so well only because the film was at least some distance towards being the critique which the Situationists wanted to make it into. The refashioning of the film thus starts to appear a little less devastatingly witty than it might appear to those for whom the historical situation alluded to in the original film is obscure. For evidence of such an audience, one can look at the comments on the film on its IMDB page, one of which, completely muddling the national origin of the film, mistakes the film as 'a hokey Japanese karate movie', hence not only missing the anti-colonial premise of the original, but even showing a complete blindness to the differences between Asian nationalities on the basis of which such might be read. Another comment wonders 'what the hell' the original was about, and a third proposes that the détourned film is 'a standard martial arts movie with all its gratuitous, relatively content-less violence'. From today's perspective, it would seem strange if the Situationist group, with the history of anti-colonial struggle in France's own colonies (from Algeria to Vietnam) still fresh, and with the attention that these gained from the French left – and even within the Situationists' own critiques – would not have picked up on the political dimensions of the film which these IMDB reviewers miss. Viénet, in particular, was trained as a Sinologist and spent many years in China before being ejected for his opposition to Mao. However, there seems little in its redubbing which would seem to exploit or thematise such a relation to a pre-existing narrative of struggle and revolution. Could Viénet and colleagues possibly have been blind to it? What were, exactly, their attitudes to the film? One might, for example, more generously set out to read the task of détournement here as attempting to 'liberate' a hidden subtext, to dredge it up to the light of day. This would fit the film into a certain tradition of critical theory which has attempted to look at (popular) cultural products as at once carrying the ideological purposes of the dominant class who control their production, but as also depending on a kernel of 'truth' and genuine need or desire which it must address in order not to entirely fail to interest its audience. However, this, too, would not seem to quite hit the mark: the 'anti-colonial' theme in Crush is so prominent as to hardly seem even a 'sub'-text, let alone something that anyone who has noticed it would think of as a repressed content which would need to be made conscious. Alternatively, perhaps we might conceive of Crush – or more generally of the Parisian movie houses where 'chop-socky' flicks may have been playing matinee double bills – as a special site for Situationist pleasure, rather like the inner-city streets where Debord and his colleagues liked to drift in search of 'moments' of desire and truth within the everyday, places of special ripeness for the engineering of a 'situation' or an 'event'. Does Viénet's film thus mark the kung fu movie, then, for them, as one of the privileged locii in which one might go on a sort of a cultural dérive? If anyone reading this blog knows more about this – or knows of anything written on the film – I'd be VERY glad to hear from you!